Egyptians See Their Revolution As Barometer Many Egyptians feel their revolution is still unfinished. But they believe the trial of the former president and efforts to establish democracy will help set the tone for the wider Middle East. 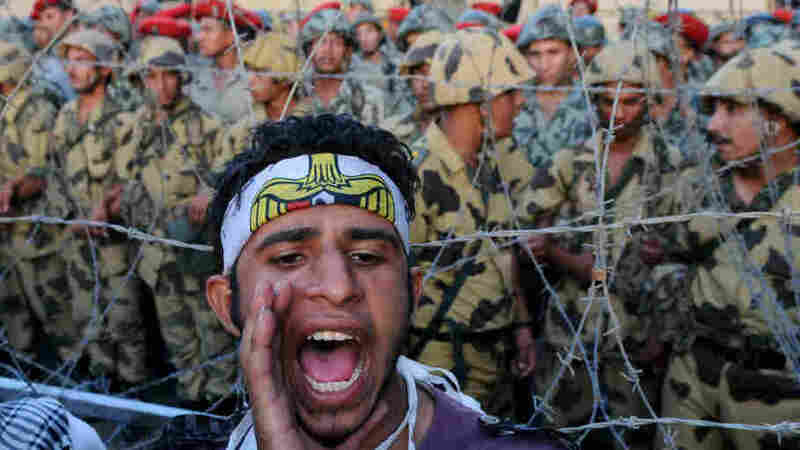 A protester shouts as Egyptian soldiers stand guard behind barbed wire at the Defense Ministry in Cairo on July 23. Egyptians say their revolution is still not complete, but they believe they are setting the tone for the region. After Egyptians toppled President Hosni Mubarak in February, many thought that their revolution, driven by peaceful, mass demonstrations, would be duplicated elsewhere in the Middle East with the same powerful results. All too soon, they saw on their TV screens that would not be the case, as uprisings in Libya and Syria brought bloodshed and slaughter. That led to uncertainty and fear in Egypt, because many agree with activist Hossam al-Hamalawy, who says that Egypt's revolution cannot fully succeed on its own. "You cannot build a democracy in a country where you are surrounded by a sea or an ocean of dictatorships," he said. 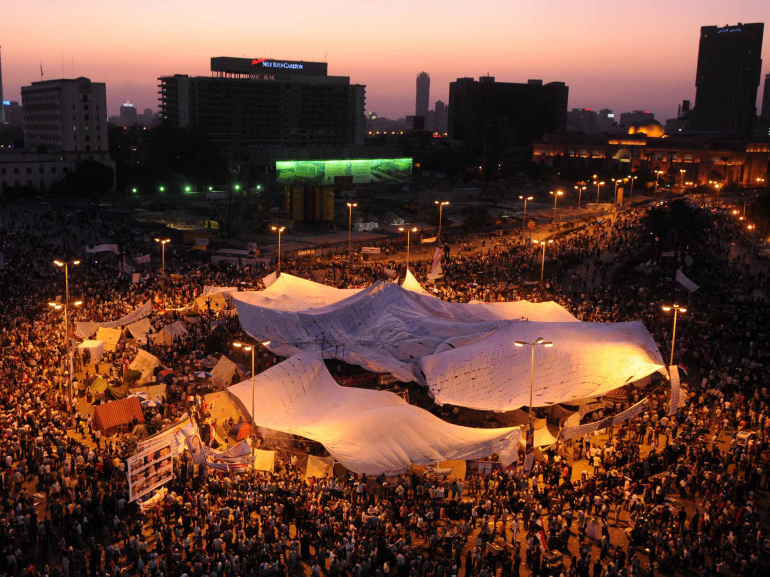 In the meantime, many who brought about Egypt's revolution began to lose hope. They watched as the Supreme Military Council, which now holds power, cracked down on protesters and slowed down change, says Hossam Bahgat, the director of the Egyptian Initiative for Personal Rights. "There were many days and weeks in which many of us felt our transition is being blocked by the interim forces," he said. But then Mubarak was put on trial, wheeled into the courtroom on a hospital bed, and put in a cage used for common criminals. It shocked Egypt and the wider Arab world, says Bahgat. Thousands of Egyptians demonstrate in Cairo's Tahrir square on July 8. Many Egyptians say they are upset with the slow pace of reforms under the interim military rulers who took over after President Hosni Mubarak was ousted. "Seeing Mubarak on trial will strengthen the popular demand for a democracy and dignity and full accountability," he said. And, he added, it could also "further terrify these autocrats and once again deliver the message that their days in power are numbered." In Egypt, everyone believes that Syria's Bashar Assad and Libya's Moammar Gadhafi were watching as the charges against Mubarak were read out. In the short run, seeing Mubarak behind bars and on trial might cause other Arab leaders to take an even tougher approach to uprisings. But many, like human-rights activist and publisher Hisham Kassem, are now confident about the ultimate outcome. "I have no doubt where it's going," he said. "Yemen, Libya, Syria, the three regimes are going under." According to Fawaz Gerges, director of the Middle East Center at the London School of Economics, what is taking place across the Arab world is a genuine revolution. "There is a new order in place. And I think there's a rupture," Gerges said. "The rupture that has to do with the mood and psychology of the Arab people. Citizens who are empowered, emboldened. They have rights as opposed to being subjects, ruled by their powerful leaders like Mubarak." That was evident before Mubarak's trial, said Gerges. But it became especially clear once the trial began and could be seen on every television set throughout the Middle East. "Having Mubarak in the courtroom has sent shock waves through the veins of the ruling elite in the Arab world, and has sent powerful messages to young Egyptians, old Egyptians, young and old Arabs," he said. "I think this is a new era." There are certain to be more ups and downs before the process in Egypt is complete. The wider Arab world will be watching intently along with Egyptians, said Nabil Fahmy, former Egyptian ambassador to the U.S. and now dean of the School of Global Affairs at the American University of Cairo. "If we succeed in taking it several stages forward politically here in Egypt, and you develop over the next eight to 12 months a political system that is accountable, transparent, participatory — in other words democratic — this will spread throughout the Middle East," he said. But none of this is guaranteed, Fahmy notes. "If we fail, it will be a tremendous setback for all those pushing for good governance in the Middle East peacefully," he added. "It will give an indication to the population and to those in government that the only way to change or to rebut change is the use of force."